A few weeks ago, I asked “What’s Wrong with My Oxalis.” I had two pots of Oxalis. Each plant look sickly, with spots on the usually bright green leaves. Two readers offered suggestions. Gale referred me to the local Master Gardeners program, an agricultural extension program I had never heard of. Ann sent me e-mail with a link to an eHow.com page that suggested that the problem was likely fungal and is encouraged when plants are grown in a cool, damp environment. 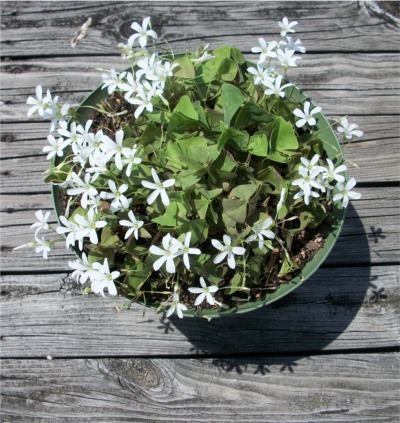 The plant I had pictured in my post had been indoors for the winter where it was often cool and damp, so I decided to put the plant on my deck, where, in the summer sun, the environment would be very different. After a few weeks of sunshine and aggressive pruning of affected leaves, my plant looks great. (See picture. Be sure to click for a larger version.) A very interesting fact about Oxalis: When grown indoors with limited sunlight, leaves grow at the end of long stalks. Grown outside in full sun, the plant becomes very compact, with leaves on short stalks and crowded closely together. Thanks to Ann an Gale for your help!